*This article may contain spoilers! I’ll start by saying I don't like scary movies, I don't like the horror genre, and I don't like being scared. 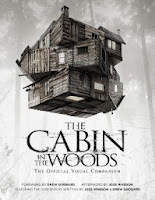 I was leery about watching The Cabin in the Woods for those reasons but I actually came out pleasantly surprised by this one. With Marvel’s new darling director Joss Whedon at the helm, I should’ve known I was going to be in for a treat rather than haunted by the stuff of nightmares. His take on the tropes of the horror genre are a welcome breath of fresh air. The movie basically takes the classic slasher flick, dissects all of their tropes, and comes up with a serious yet cynical analysis that lovingly pokes fun at what people love about scary movies. the woods. They become trapped in a bigger machine that is not only trying to kill them but also serves as a sort of insider viewpoint for the audience. 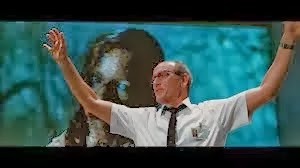 This viewpoint is what sets Cabin in the Woods apart from other horror movies; it basically sets up a second story-line inside of the movie that totally pays off. I've heard conflicting reviews as to whether or not the payoff is good or bad, but for me I think its pretty hilarious and very fitting. I went into this one thinking I could easily figure out the plot or the story twist within the first 30 minutes (Sherry didn't think i could do it), and yes- the opening scenes threw me for a loop but while I did figure it out fairly early I may have totally missed the point. The friends are first presented with the cliche of a weekend getaway on the lake in a rustic cabin. They are warned by the foreboding and foreshadowing gas station attendant and, of course, ignore his creepy yet all-important speech. Once they get settled into the creepy cabin they proceed to follow every rule in the book from various classic and modern horror flicks. I was disappointed in that the blonde didn't run around in the forest only to fall and sprain her ankle, but the “black guy” wasn't portrayed as a dumb jock, nor was he killed off first. So, maybe I give it credit for bucking some of the more blatant and offensive tropes as well as poking fun at others. The story takes a turn for the better as the “insider viewpoint” makes itself more apparent and turns this campy slasher into an action comedy. Without ruining the twist, I would say that turning the modern “reality tv” angle of more modern films like Saw and Panic Room back on themselves is a pretty ballsy premise. Here, it works. 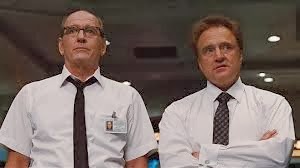 Even with a comedic spin and a sense of self-awareness Cabin in the Woods does manage to tell an interesting and entertaining story. However, for as many things it does right I do take issue with a couple points in the movie. First, they introduce a lot of people that seem important that apparently aren't there to do anything (well, except die later of course). Second, they explain a huge bit of the story “twist”, but they fail to explain anything about the other monsters (spoiler, sorry). Finally, for as much as they got right with the horror satire I feel like they either completely dropped the ball or set the bar too high for a sequel. If rule number one of horror movies is that the killer is never dead at the end of the movie, they completely botched it. 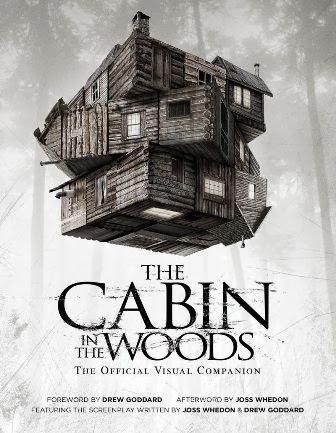 In the case of Cabin in the Woods, this simple rule of always leaving room for a sequel seems like a vast oversight. Whedon made The Avengers work, he could probably make this work too. I skip past the scary movies section of my Netflix queue on a daily basis, but The Cabin in the Woods is a welcome romp through an interesting take on the genre. Its not quite a homage to horror, nor is it as slapstick and sarcastic as Scary Movie, but it is a pretty good middle ground between the two. It’s a quirky action comedy in horror clothing; despite its ending, its definitely worth checking out. Enjoy. 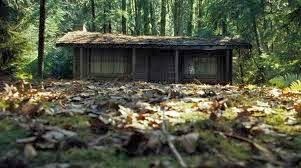 The Cabin in the Woods came out in April 2012 and has been one of the best horror films with a hint of comedy in years (in my opinion). The movie is certainly one of a kind and keeps you entertained and guessing the entire length of the film. The film itself is about 5 friends who need a break from college and decide to go on a weekend trip to a cabin on the lake in the woods. Although the movie itself is an original idea, the character personalities are very cliche. The circle of friends are made up of the jock, nerd, goober, shy virgin, and the promiscuous one. These categories are very typical in films that are based upon a group of friends. During the first night of their stay, they explore the cabin and the grounds, and discover some really cool/retro trinkets and keepsakes. They discover a diary from just past the year 1900, written by one of the original household members and things take off from there. They find themselves in a true horror movie situation where they are running from & fighting evil while trying to stay alive. show (so to speak). The movie is setup to make you think that these characters may be on a reality tv show/movie ( like candid camera) but then you learn that the set up is much more than that. Not only were these characters strung up as "puppets", but they are also being used as sacrifices to stop the end of the world. I have seen this movie a total of 12 times (the first 11 times within a 5 day period), and the 12th time was yesterday. To me, this is one of those movies that you have to watch at least twice. I have also watched the movie with all of the commentary available plus other special features of the film. I chose this film as my 2013 favorite Horror film vs your typical 70s/80s horror flicks because this one was unique (not scary), with a comedic undertone. I am a fan of Joss Whedon and I feel like he does phenomenal work. In my opinion, this movie is much more entertaining to watch with somebody. You can not help but discuss the films events as they are happening. on a scale of 1-10, I rate this film a 10. If you have not seen this film already, I suggest you turn out the lights, fire up your DVD viewer of choice (or Netflix Instant Watch), pop some popcorn, and get comfy cozy on that sofa and enjoy 95 minutes of entertainment.